I allow most patients I treat for nail disorders to keep their acrylics while undergoing therapy unless wearing them would be detrimental to their recovery. by Orville J. Stone, M.D. I believe that I have a liberal attitude toward acrylic nails, especially for a physician. I allow most patients I treat for nail disorders to keep their acrylics while undergoing therapy unless wearing them would be detrimental to their recovery. I even have refused newspaper interviews about acrylics because I realized reporters wanted to be critical of artificial nails. Obviously, they would not want to question me, a dermatologist, about the enjoyment of wearing acrylics. Contrary to popular myth, there are only a few situations in which acrylics should not be worn. Even people who are at risk for nail problems can increase their odds of success by keeping the acrylic nails short and avoiding wet work. A person who has had a reaction to acrylics in the past is obviously a poor candidate to wear them now. If the client has had an allergic reaction to acrylics, she may be prone to a reaction to other artificial products and should wear her nails naturally. However, as I noted in a previous column (“Acrylic Nail Reactions,” August 1992), I do not see many true allergic reactions to acrylics. More often, I see irritant reactions, which means the acrylic chemicals are penetrating the nail plate and irritating the sensitive skin of the nail bed. An irritant reaction to artificial nails is common for people with thin nail plates or who are sensitive to chemicals. A true allergic reaction to artificial nails is characterized by pain, swelling, itching, redness, and small blisters around most of the nails. The symptoms should disappear within a few weeks of removing the product. An irritant reaction, on the other hand, often manifests as a thickening of the nail bed’s keratin layer, which can sometimes cause the entire nail bed to thicken. In severe cases, the nail plate can separate from the nail bed. 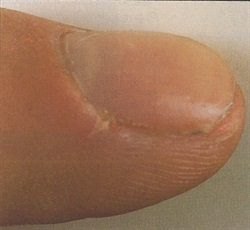 An irritant reaction can occur on one nail or on all 10. You can determine whether a client has an allergic or irritant reaction by applying the acrylic to one nail. Keep the nail short. If the client experiences redness, swelling, or blisters, she is allergic to some ingredients in the acrylic system. If there’s no reaction within a week or two, it is probably an irritant reaction. This limited exposure won’t trigger an irritant reaction. Some clients with circulatory disorders are poor risks for acrylic nails. In particular, if a client has scarring or an ulceration (a skin infection) around the fingertips, it is best to avoid acrylics. Clients with mild circulatory disorders, such as an excess reaction to low temperatures, which is demonstrated by color changes in the skin or nail beds, or extremely cold hands, should be serviced with caution. Because these clients are more prone to infection and tend to have reduced feeling in their arms and hands, you must take care not to cut the skin. Don’t apply acrylics to clients with separated nails. When the nail reattaches and the client learns to care for her nails better – not digging under her nails, avoiding wet work, and wearing rubber gloves – you can reapply acrylics. I would be cautious, however, if the prior separation lasted more than four months after you removed the product. A longer duration indicates an underlying health problem. Clients whose hands are constantly in water, either at home or at work, will have difficulty keeping up acrylics. The constant exposure to water contributes to product lifting, creating a breeding ground for bacteria between the artificial product and the nail bed. This increases the odds for a chronic paronychia infection, which is a yeast infection usually found beneath the posterior nail fold. There are other conditions affecting clients that put them at risk for problems with artificial nails. Psoriasis, for example, is known to spread to injury sites. This means if you nick a cuticle or the client has an irritant reaction to acrylic, the psoriasis could spread to her nails. Once psoriasis spreads, it is likely to remain for a long time. Removing the product will not reverse the psoriasis. Lichen planus and lupus erythematosus are two skin diseases that can spread to injury sites and leave scars. Lichen planus, although uncommon, is far more destructive than lupus. Unless it is treated with oral cortisone medication (which must be prescribed by a doctor), it can cause permanent scars. I have seen lupus patients lose their nails. However, unless a client with lupus has cold, white hands (which indicates poor circulation), I would not be too concerned about applying acrylics. Needless to say, people who appear to have failing health are poor candidates for artificial nail services because they tend to be susceptible to infection and they heal slowly. If a client has any progressive nail changes, it would be wise to evaluate her nail history and to question her medical history. Ask if she has any illnesses or skin problems. Document your observations, her reactions to products, and her responses to your questions; otherwise, you may be blamed for changes that you didn’t cause. If a client has arthritis of the distal finger joint, longitudinal ridging on the nails, or spontaneous thickening of the nail bed, refer her to a physician before you perform any nail service. Finally, clients with skin problems around the nail, such as severe hand eczema accompanied by ridges on the nail, are more likely to have adverse reactions to artificial nails than clients with healthy skin. While you don’t have to turn away such clients, I would use great care servicing them. Avoid getting product on their skin and be sure all product dries thoroughly before they use their hands. Ideally, all clients would be perfectly healthy before you use any product on them. However, there are clients who may want acrylics to hide nail deformities. You can cover some nail deformities, but be careful the client isn’t trying to hide something that requires medical treatment. There are times you should insist that the client see a physician before you service her. Even if the condition is minor or temporary – waiting for hangnails to heal or a separated nail to reattach and grow out, for example – advise the client to wait. Any infection around the nail, such as chronic paronychia, should be treated by a physician before you apply acrylics. If the client is already wearing acrylics and presents with chronic paronychia, refer her to a physician. Applying acrylic nails on clients with fragile or brittle nails can be risky, although that is precisely why many people seek nail services. I would only hesitate to service such clients if their nails are unusually fragile and brittle. When evaluating a client’s suitability for wearing acrylic nails, it’s better to be safe than sorry. Part of your responsibility as a professional is to emphasize clients’ long-term nail health over their short-term beauty demands. If a client has a medical condition that makes her a better candidate for natural nails than acrylics or if she has a disorder that needs treatment first, stand by your recommendation and remind her that health is an important part of her beauty regimen. Orville J. Stone, M.D., is a dermatologist practicing in Southern California. He has taught at medical schools for 30 years and has published 150 scientific papers. His first paper on nail disorders appeared in 1962.